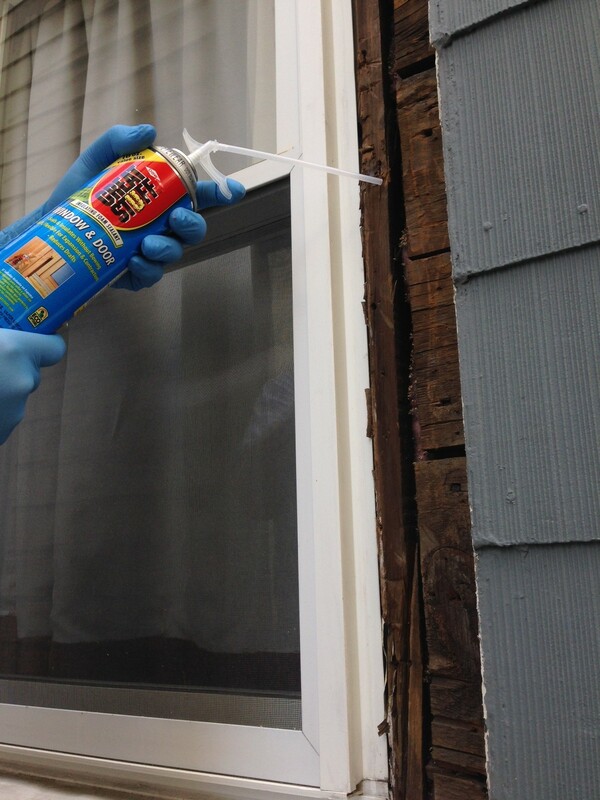 Our reasons for replacing it were not entirely cosmetic–rotten window trim can let water infiltrate behind your sheathing (the board, plywood, or OSB layer underneath your siding). If water gets to your sheathing, all sorts of bad things happen: mold, rotting insulation, and in the worst cases, rotting framing members. 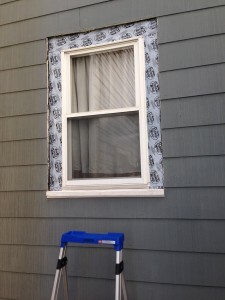 We’re lucky because the window itself is a relatively new vinyl replacement window. Vinyl window are awesomely weather resistant so I knew we didn’t have actual window issues. If our windows were wooden frames, we’d likely have a bigger problem on our hands. Demolition is my favorite part of any home improvement project. Nothing like bashing things with hammers to make me smile! For this project through, you’ll want to be gentle. First try and figure out which trim sections are rotten. 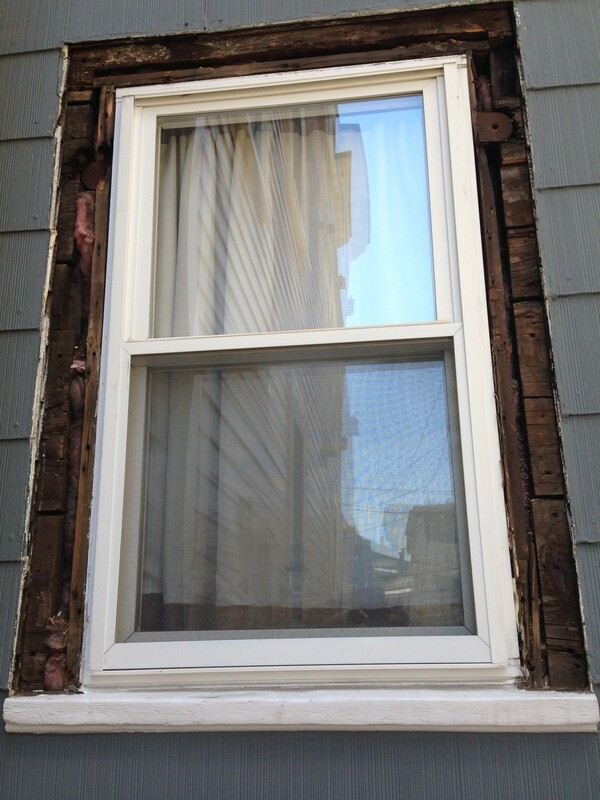 Our window had both a flat board (sometimes called a “brick mold”) as well as a decorative molding. I originally thought it was only the brick mold that was rotten, but it turns out the molding was also getting soft in spots. Poke around with a screwdriver and you’ll quickly note which components are in need of repair. If it feels like wood, great! If it feels rubbery or spongy… then it’s time to tear it out! Once you’ve determined which components need to go, use a small pry bar to start removing the pieces. 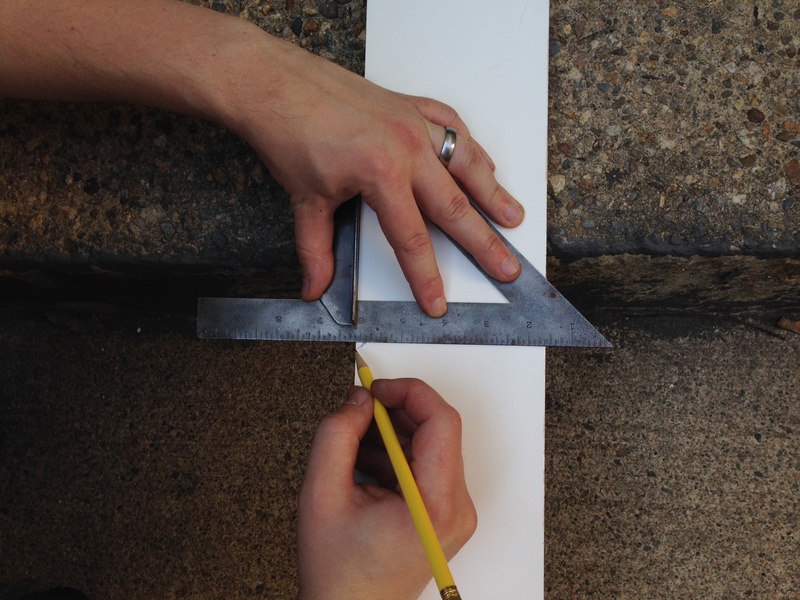 Your goal is to expose enough of the boards to get accurate measurements. Once you can clearly see what’s where, take a photo and measure the dimensions. If you can keep the trim pieces from falling apart as you demo, it will make cutting your new pieces to fit all that much easier. Wear latex gloves! This stuff is uber sticky. Like interior of a hot marshmallow sticky. And it’s not good for your skin. And you are almost certain to get it all over your hands. Wear some gloves and you’ll thank me later. Make sure the area you’ll be foaming is clean. 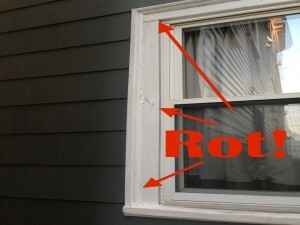 Foam will stick to anything, including the layer of dust and dirt that likely resides around your window. A shop vac makes short work of this. After it’s applied, it continues foaming and expanding. So make sure you lay down a thinner layer than you need and let it expand to fill. You can always add some more on the second pass. Once you break the seal and pull the trigger on the can of foam there’s no stopping. You can’t re-use a can of spray foam and it starts to harden in the tube after about 15 minutes. Sooner if you don’t spray for a few moments. You have to keep moving and spraying if you want to get your money’s worth out of the can. Oh you thought you were finished? Not quite. 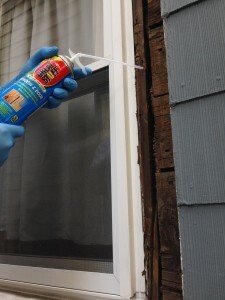 Break out the caulk and run a bead on all of the joints. 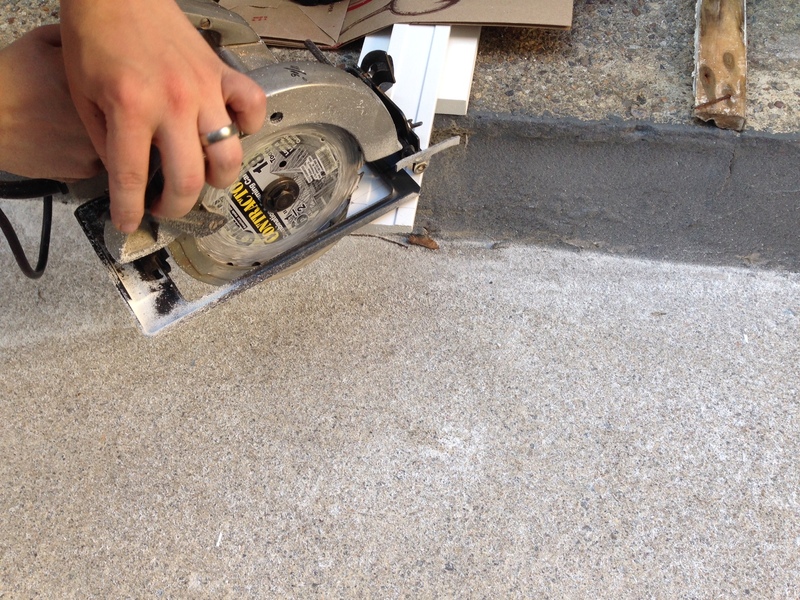 Smooth each joint with a moist finger (no joke, the best way to get a good caulk line). 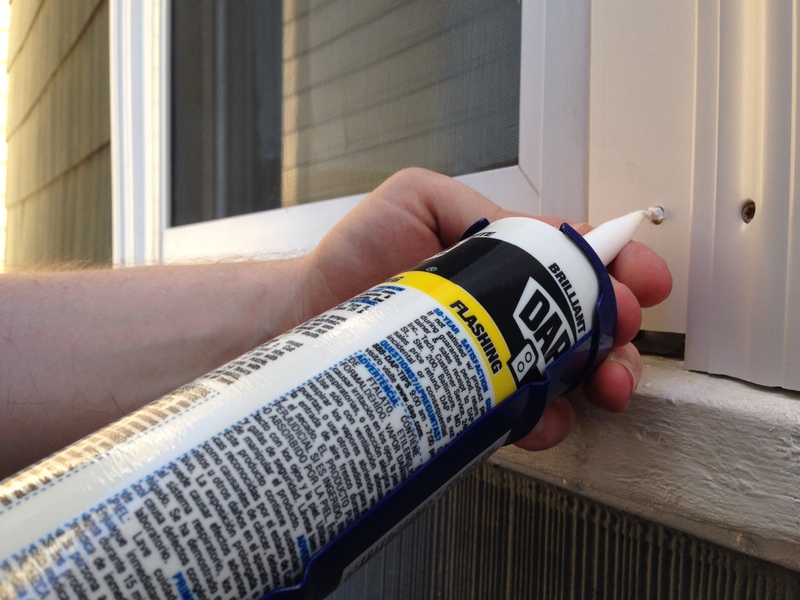 Don’t forget to add a dab of caulk to each screw hole as well. Once the caulk is dry you can decide whether you want to paint. 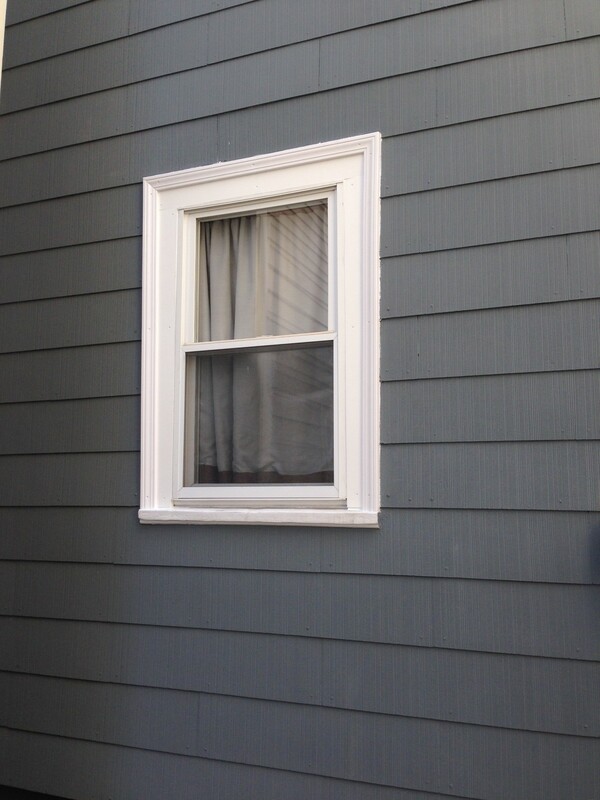 So far we haven’t, because the new white trim matches our existing trim pretty well. We’re focused on building (hah!) a sustainable life, both from a skills-learning perspective AND from a stable financial perspective. Our immediate goal is to “retire” early to a homestead in Vermont and leave our city jobs behind. Want to know more? Check out our About page to investigate the radical frugality journey so far. 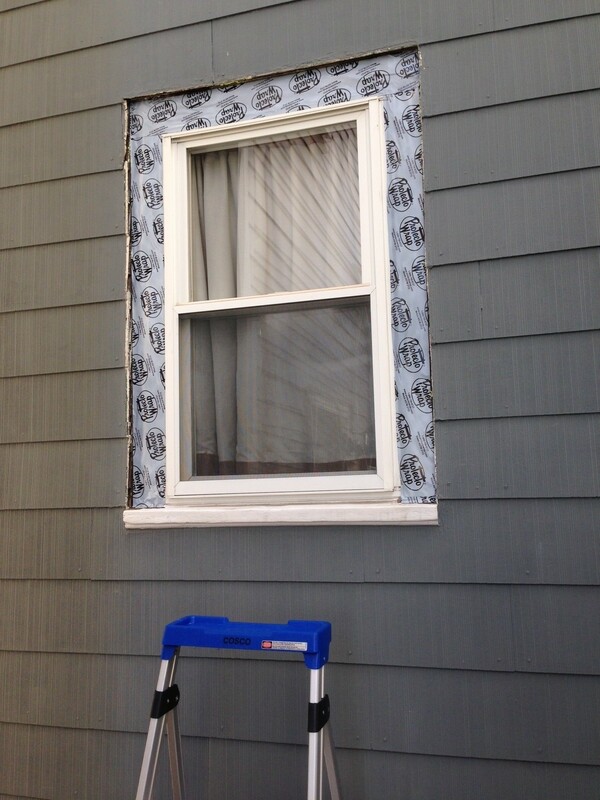 Hope your own window trim project goes well! Feel free to ask questions in the comments — we still read and respond to them even though this post is nearly a year old. Although I do not have a window trim to replace, I do have a door trim to replace. So this is basically perfect timing as much of what is required for me to do will be the same as what you did for the window! I will be bookmarking this page for that project, that’s for sure! Oh cool, glad you found it useful! Your door should in theory be framed much the same way as a window, so other than slightly more material it should be a cinch. Good luck, let us know how it turns out! 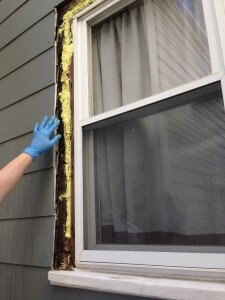 Spray foam is an awesome product, but is also the stickiest substance on earth. Once on clothes, you will NEVER get it off. Just like roaches, this stuff will survive a nuclear attack. Similar to eating pizza or BBQ, I can’t use spray foam without getting it all over myself. Wear your worst shirt and pants. This man is not joking. Another thing to watch out for that I should have mentioned in the post is to make sure you have a drop cloth in place beneath the area that you are spray foaming. We didn’t originally, but as I started to see some drip Mrs. FW ran to get our drop cloth and saved the concrete walkway. I managed to not get any on my clothes, but I did get some in my arm hair which took several days worth of showers to get out. But there is something about spraying foam that is tremendously fun. It’s like using a water pistol, except you are shooting out almost-exploding goo! I’ve used a pro setup on a past job that has a permanent tube and bigger, more powerful cans. I felt like the draft-terminator! Habitat for Humanity FTW! I agree, totally fun! Kind of like being the person who gets to work the hose when blowing insulation into the attic. Loading the hopper? Not so much fun. I’ve never blown in insulation, but it sounds fun. Something tells me it’s an itchy job! True. Spray foam gets everywhere. But ACETONE will completely destroy it before it hardens. DIY Tip: When using hardware store chemicals, always read the cleanup instructions. Buy the solvent needed when you’re buying the goopy goo! For spray foam, nail polish remover works in a pinch, but often has moisturizers added. Just buy the quart/liter sized tank of pure acetone. Because if, like me, you’re incapable of being careful enough, acetone, and lots of it, will save the day. Or save the pants/ siding/ carpet/ sidewalk. It can even be used to clean out the applicator and spray nozzle so you can reuse a partial can. Unless the foam has set up, then it’s game over. … what’s a measuring tape? Um, writeup please? The much loved frugalwoods-mobile has more than a bit of body rust after nearly 20 years in cold climates. I’ve always been interested in learning body work, it seems like it’s as much an art as science to make it look nice! Good luck! Evaporust. Followed with Mr Clean magic eraser or a never-touched-rust wire brush to remove the black. These are awesome tips and steps. We have not done a window project; however, we recently re-tiled and installed a new toilet in our bathroom. We lost a few tiles along the way of figuring out the tile cutter, but overall, we are really happy with the results and it saved us a ton of money! Super impressed you did a bathroom! We need to re-grout the tile around our tub, and patch the enamel on said tub, but I think that’s a winter project. In Boston we have to prioritize projects that require outdoor operations for our somewhat short summer. The winter project list is starting to pile up after several months of putting them off! It looks great! That’s a really nice step by step of the process. We do a lot of DIY projects at home, most recently we built a backyard corn hole game set. Thanks! A corn hole set is something that’s on my long term to-do list. It seemed like every get together we ever went to in the midwest had one but I don’t see it that often here in Boston. We don’t have grass, but our neighbor’s back yard would be perfect… Hmm. Now you have me thinking! Did you emblazon it with your university colors? Awesome work! You guys are handy dandy and great photos to back up your post! The savings is super duper too! Thanks! The credit for the photos goes to the magnificent Mrs. Frugalwoods. She manages to document these projects while simultaneously doing at least 50% of the work! It’s a team effort around here! Great tutorial. I am ashamed at how not-handy I am. But I think it’s because I just have never really tried. I’m pretty good at new things, so maybe I’ll get around to this stuff when I’m back at my rental. Thank you so much for this thorough and well-written post! We live in an older house, so I always worry a bit about what we’ll do when this stuff comes up. It does seem that with old houses there is always a maintenance backlog! Cross one project off the list an another rears its head! You’re after my own heart! I love that you talk about OSB and specifics, not just “the wood underneath.” Excellent accuracy, Mrs.Frugalwoods! This is a great tutorial. So many projects are totally doable, you just need to venture forth! Thanks! It’s true that just “getting started” is half the battle. It’s intimidating but so worth it in the end. And then you get to look at your accomplishments every day! Thanks for stopping by! Agreed. Thanks for mentioning specific product/material options. I’m currently moving/adding 7 windows in my fixer upper from the ’40s. All my sheathing around them looks like yours. Longer term I need to put flashing on all the windows that didn’t move/change. Which means I may as well re-trim them, so I appreciate the tip on the PVC that won’t rot. Good thing I just picked up a few boxes of composite decking screws at the HfH ReStore. Wow this is super useful! I just bookmarked this page as this is a project I’ll definitely have to tackle within the next few years. Oh good! Hope it’s helpful! Another thing to add for my DIY list. We don’t have a guy in the house, I pretty much do everything around the house and I’m too frugal to pay for something like this as well..so thanks a lot for this! I’m doing this today. The painter is coming tomorrow to pressure wash and paint. I had a person called to repair the wood but as happens so often in the south it fell through. So I’m doing it myself. Why? With a cold and rain threatening. Because of my HOA, do not get me started. Got any ideas about how to do house trim above the fascia? Hey Kathleen! Sorry I didn’t see this until today, I hope your work was successful! I’m afraid I don’t really have tips for trim above the fascia anyway though, other than the obvious “a nail gun is going to make that so much easier”. I’ve done that trim work on a new house (Habitat for Humanity) and it was unfairly easy thanks to scaffolding. I’m sure it’d be much more of a bear on the ladder. Probably would need two people (and two ladders) to handle the long stock. This was very helpful. Thanks so much. Vinyl is a great material for the actual window. For the trim, cellular PVC (what I used above) will certainly hold up well long term. 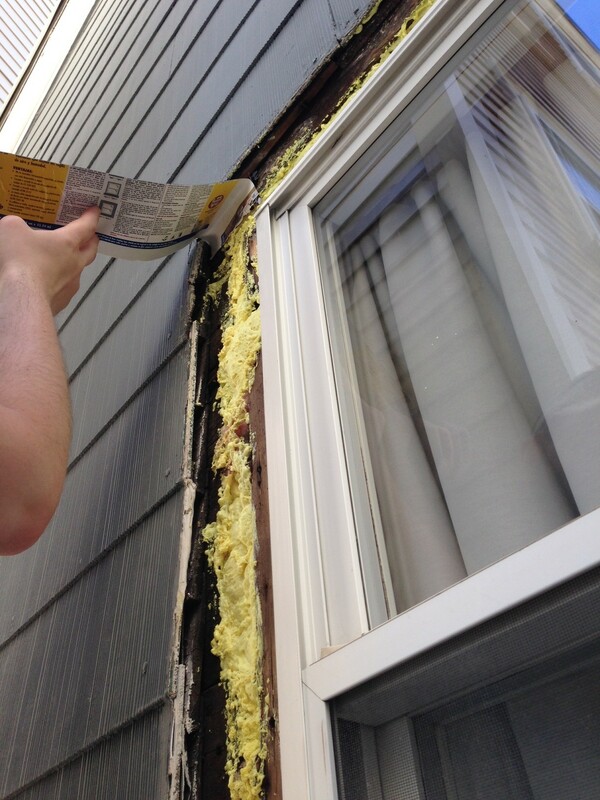 If you need to go with wood (for HOA, etc…) then cypress trim is supposed to be very rot resistant. Not common up in New England though. Frugal tip: cans of spray foam are reusable! Remove the application straw immediately after you apply the spray foam. Spray a pipe cleaner with WD-40 and pass it though the straw to clean it out. Use the WD-40 and pipe cleaner combo to clean the nozzle as well. Once everything is clean you can reattach the straw and reuse the can at a later date. The front of my house has a brick exterior and 4 normal sized rectangle windows (about 3 ft wide by 5 feet tall). The opening of the brick front is much larger vertically, so below each window is a square (about 3 ft by 3 ft) piece of white wood with a trim around it. 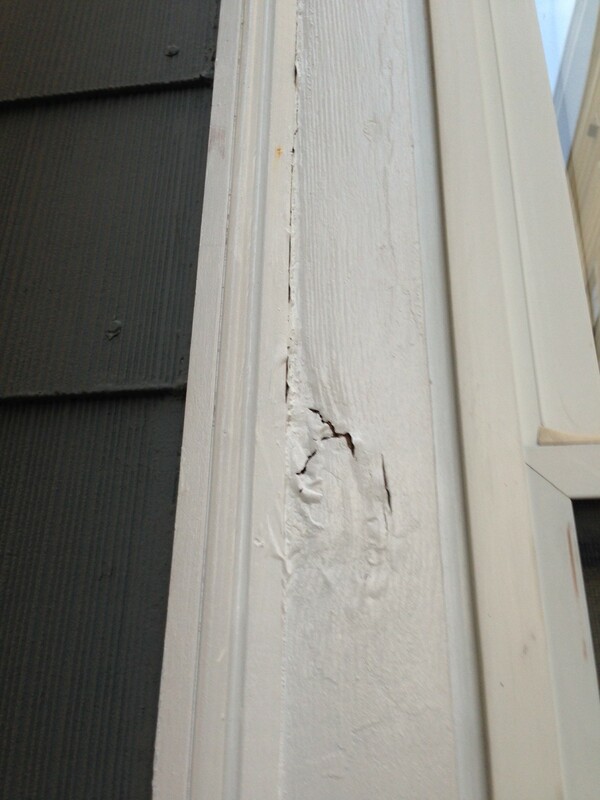 That wood and trim is rotting out and needs to be replaced. This seems easy to do, I was just looking for some advice before I start. What is that bottom piece of the window/wood called anyway? 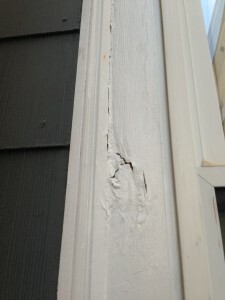 I was just told by an “expert” that our exterior frame could not be fixed even though it has slipped down and has a couple of spots that will not even be connected after they “fix”it. We love the door or would just replace it. The issue is that we live in AK and with the earthquakes and extreme temperature changes it can be damaging even to the best made material. Suggestions? He honestly tried to tell me the the window and frame were all one piece before I pointed out to him that the trim was coming off in one spot. I would love to let them come and do what you want the finish work for the guarantee, but don’t want something that looks like arse. Great tutorial! I have an older home (not old enough to have that “character”, just old enough to have “popcorn ceilings” etc.). There are so many things i am redoing and only so much money, so I have to pick and choose. Granite, i cannot do by myself. 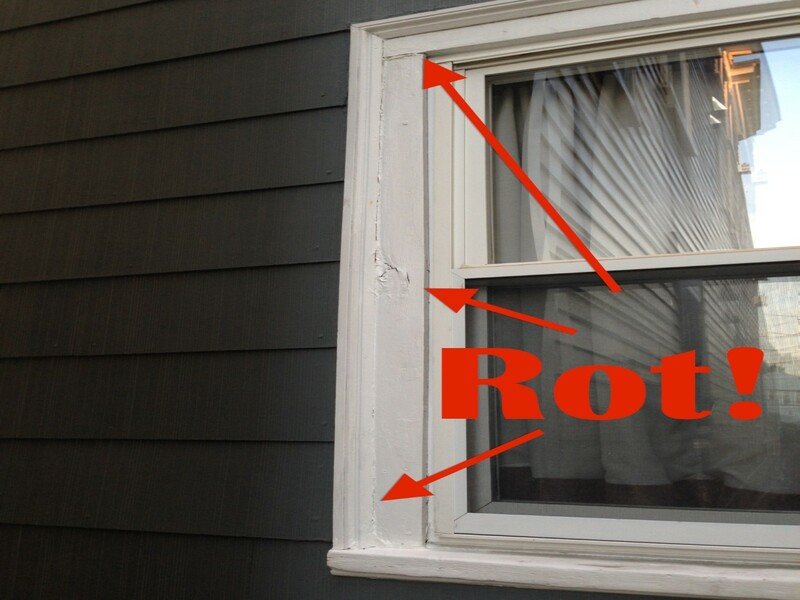 Replacing rotted trim, I can! Thanks to you!!!! The exterior wood trim on my garage door needs replacing but at the bottom there is a space that lets allot of water into the garage. The space doesn’t appear to be from rotted wood, it somehow seems to be that the house itself wasn’t made to connect to the floor. Can u help? Confused about the fire and ice tape… this is applied over the top and directly onto the hardened foam spray? I like how you sad that demolition is the best part of any home project. We are thinking of replacing our downstairs windows this spring. Thanks for the tips on how to replace exterior windows. Great article, but better things than expanding foam ? There are many reason it is called “Great Stuff” … Not even sliced bread is better !! You could, in theory, restart the can if you put the tip on that little peg on the top of the trigger. When it is cured later, you cut that part of the tube and could use again (that’s how it’s described on the Great Stuff can) but realistically, in one can there is so little amount that it is barely enough for one window with large gaps.. and for $5 bucks, I guess a project like this can afford $50 bucks of spray foam, even if like my old house, there’s potential for 10 windows. My carpenter put in 3/4 thick instead of 7/4 thick trim It does not match thickness of above trim. He said this was ok. I don’t like it and see it is indented. Will water get behind? Width and length is ok.